This tutorial is Maven and command-line based; the reader may follow this verbatim or use their favorite Java IDE. with each module having a POM that describes its dependencies. We start by creating the required project skeleton. Note - if you use alternative groupId, artifactId values remember to update the package-info.java and import statements in the files used throughout the rest of this tutorial. We now create the required modules. For further detail see Semantic Versioning. Data transfer between the components is achieved via the use of Data Transfer Objects (DTOs). String SQL_UPDATE_ADDRESS_BY_PK_AND_PERSON_ID = "UPDATE " + TABLE_NAME + " SET CITY=?, COUNTRY=? " The dao-impl has a dependency on dao-api. Also PersonalDaoImpl.java and AddressDaoImpl.java implementations (see below) have dependencies on the slf4j logging API. This dependency information is added to the <dependencies> section of dao-impl/pom.xml: i.e. dao-impl’s repository. Implementations should NOT be shared; hence no package-info.java file. and create the directory ~/microservice/rest-service/src/main/resources/static/main/img into which save the following icon with the name enroute-logo-64.png. As the rest-service module has dependencies on the dao-api and json-api these dependencies are added to the <dependencies> section in ~/microservice/rest-service/pom.xml. A JSON-P implementation dependency is also included so that the rest-service can be unit tested. Implementation types should NOT be shared; hence we have no package-info.java file in the REST component. We now pull these Modules together to create the Composite Application. An in memory database (H2). By adding the following dependencies inside the <dependencies> section of the file ~/microservice/rest-app/pom.xml, we add the necessary Capabilities to the rest-app’s repository. Finally, our Microservice will be configured using the new R7 Configurator mechanism. The application Archetype enables this via ~/microservice/rest-app/src/main/java/config/package-info.java. Note - If you are a linux/unix/*nix user, you might need to escape the exclamation point in the above command. Now build the rest-app bundle using package command. Note - if this build fails then check your code and pom dependencies and try again. 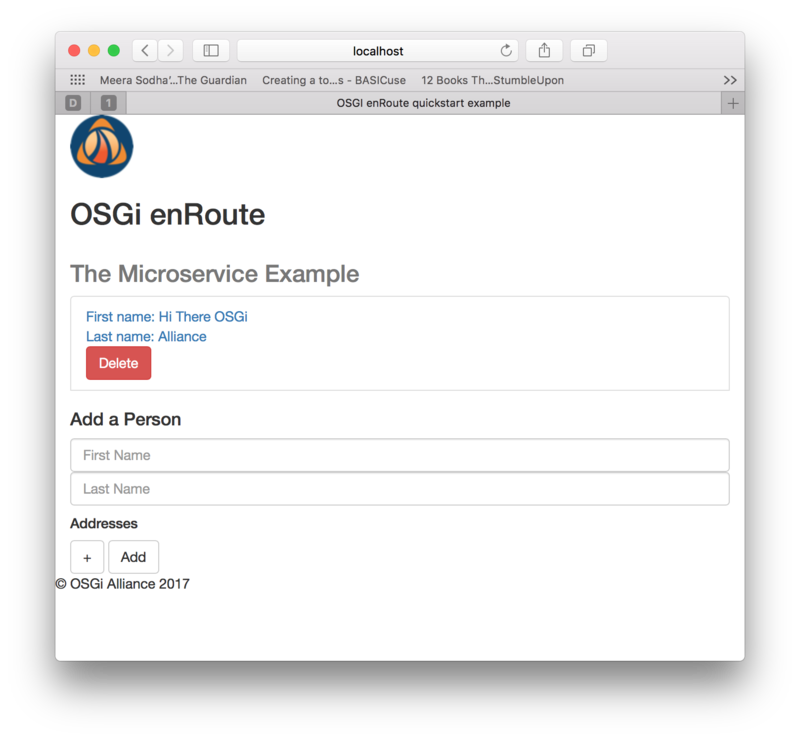 We now generate the required OSGi indexes from the project dependencies, and resolve our application. Note Don’t do a clean before running this step, it’s building the indexes and resolution from the bundles you made in the previous step. Also, you don’t need to run this step every time, just if your dependency graph needs to be recalculated. And finally generate the runnable jar from the top level project directory. Re-inspecting ~/microservice/rest-app/rest-app.bndrun we can see that this now explicitly references the acceptable version range for each required OSGi bundle. At runtime the OSGi framework resolves these requirements against the capabilities in the specified target repository: i.e. target/index.xml. Finally, if we create and run the debug version of the Microservice we can see all of the OSGi bundles used in the actual runtime assembly.